Berthalina, Bob, Guang and Jake had a great time meeting young people, parents, and career counselors from the greater Denver, Colorado area all looking to learn more about our international travel opportunity that broadens an understanding of Japan and other cultures from around the world that one meets in our program. 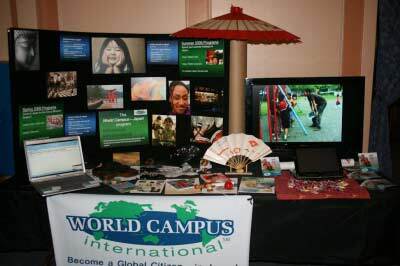 In addition to video from past World Campus – Japan programs, those that stopped by our table got to look at traditional and modern Japanese products as well as try some Japanese goodies. We are looking forward to meeting some of you in one of our upcoming programs in Japan! Previous PostSuita City is Getting Ready to Meet the New WCJ ClassNext PostMeet Atsushi Nashimoto!